Digitalization changes everything – not at least ourselves. Dirk Sebald is an experienced leader with a strong IT background. He was leading very successfully various companies like adesso ag www.adesso.de and COGNOS through complex change processes as CEO. For four years he was Global Managing Director for Markets, Products & Strategy at the Data Provider SIX Financial Information www.six-financial-information.com and afterwards he build up in the role as Group Head Innovation, the complete Digitalization and Innovation process for SIX Group www.six-group.com Dirk was one of the Founders and Initiators of the Swiss FinTech Innovations Initiative www.swissfintechinnovations.ch He is also the author of the book “Potenzialmanagement”. 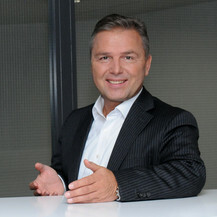 Since 2017 he is Co-Founder and CEO of Deon Digital AG www.deondigital.com Deon Digital’s core product is a revolutionary contract language and operating system, which runs and works on any type of blockchain technology, it enables businesses to build agile and fast collaborative applications and marketplaces in various industries. Dirk was born in Dortmund and grew up in Bavaria. He is a creative and at the same time empathetic individualist who enjoys challenging received knowledge. Despite a deep appreciation of traditions, he is a lateral thinker who is persistently questioning the meaning of things. Dirk is a family man who enjoys nature as a mountaineer, skier or olive farmer, practices music and opera singing and loves great literature on an eclectic array of current topics.